The aim of this Journal is to produce high quality articles on related aspects of public health, health policy and clinical analysis which can improve health care and outcomes for persons suffering from Orphan diseases, furthermore to increase rare diseases expertise globally. The Journal Rare Disorders: Diagnosis & Therapy publishes articles related to rare diseases behavior, diagnosis, treatment and prevention. 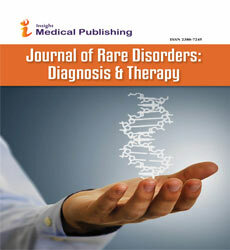 Journal of Rare Disorders: Diagnosis & Therapy emphasizes on novel clinical features, clinical description, rare case reports, Molecular genetic etiology, pathogenesis, molecular biology, social sciences, health economics and health management of rare diseases. Muscular distropy is a muscle disease which weakens the musculoskeletal system. They are characterized by progressive skeletal muscle weakness. Muscular distropy is generally inherited and they follow various inheritance patterns. Diagnosis of muscular distropy is based on biopsy of muscle, electrocardiography. Abnormality of chromosome may be due to extra irregular portion of chromosomal DNA. There are various forms of abnormalities; they are structural abnormalities, numerical disorders, Translocation. Journal of Rare Disorders: Diagnosis & Therapy, Journal of Childhood & Developmental Disorders, Journal of Genetic Syndromes & Gene therapy, Journal of Genetic Mutation Disorders, Journal of Genetics Disorders and Genetic reports, Italian Journal of Pediatrics. Sickle cell anemia is one of the hereditary blood disorders, caused by genetic mutation, symptoms of sickle cell anemia includes, sickle cell crisis, Vaso-occlusive crisis, splenic sequestration crisis. Orphan drugs are the pharmaceutical agents developed specifically to treat rare medical conditions. Journal of Developing Drugs, Orphan Drugs : Research and reviews, Rare Diseases and orphan Drugs. Rare autoimmune disorders are caused when immune system of the body reacts, against our own body, thus leading to many autoimmune disorders. There are several autoummune disorders they are celiac diseases, diabetes mellitus, graves diseases. Rare bone diseases affect human bones which inturn disturbs skeletal system. Achondroplasia, bone cancer, Ewing tumour of bone, neurofibromatosis, osteoclastoma are few rare bone disorders to specify. Innumerable division of cells, leading to the formation of malignant tumour is called Cancer. There are various types of cancer, some of the rare cancer diseases are Angiosarcoma, Alveolar soft part sarcoma, Chondrosarcoma, Endocrine oncology, Fallopian tube cancer. Rare blood disorders effect redblood cells, white blood cells, platelets multiple myeloma myelodyspastic syndrome are some of the rare blood disorders. Children affecting with rare diseases are Rare Pediatric diseases, there are various causes for pediatric diseases some of the rare pediatric diseases are, Congenital Heart Defects, Eisenmenger Syndrome, Kawasaki Disease.